First cut a 6" x 9 1/2" piece of yellow card stock and fold it in half for the base, a 4 1/2" x 5 3/4" piece of pink for the middle layer and a 4 1/4" x 5 1/2" piece of white for the front layer. 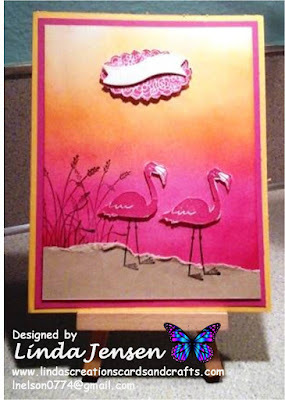 Then create the background by sponging Stampin' Up! Melon Mambo and Daffodil delight inks from dark to light starting at the bottom with the Melon Mambo. Next stamp the grass using a stamp positioner (I love love love my Stamp a ma jig LOL!) 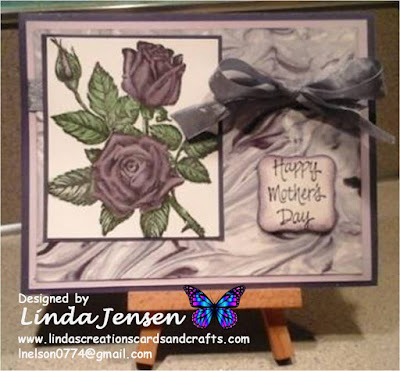 and Stazon Jet Black ink then create the ground by tearing the edge of a piece of Stampin' Up! Crumb Cake card stock and attaching it to the bottom of the background over the grass. Next stamp the flamingos over the ground in Stazon Jet Black ink then stamp the flamingos and sentiment background in Melon Mambo ink on scrap paper and cut them out. Next stamp the sentiment in Daffodil Delight ink and cut out with a die from the Stampin' Up! Itty Bitty Banners die set and attach it to it's background with a mini pop dot then attach the flamingos and sentiment to the background with additional mini pop dots. Then attach the background to the middle layer, the middle layer to the base and enjoy!